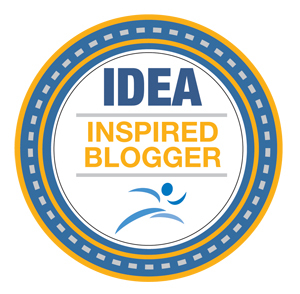 Disclaimer: I am a Skirt Sports ambassador but I was not asked to write this post. Links below may be affiliate links. 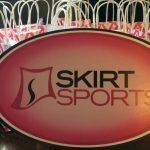 Recently, Skirt Sports came up with a fun new idea: the Skirt Box. Basically you get their top five skirt products to try and then you get a discount based on the number of items you keep. Usually, you will get the Lioness, the Gym Girl Ultra, the Happy Girl, the Lotta Breeze capri, and the Tough Girl tights. After you order, Skirt Sports contacts you and figures out the best Skirt Box for you. Deb from Confessions of a Mother Runner and I thought it would be fun to show you what those skirts look like in real life. 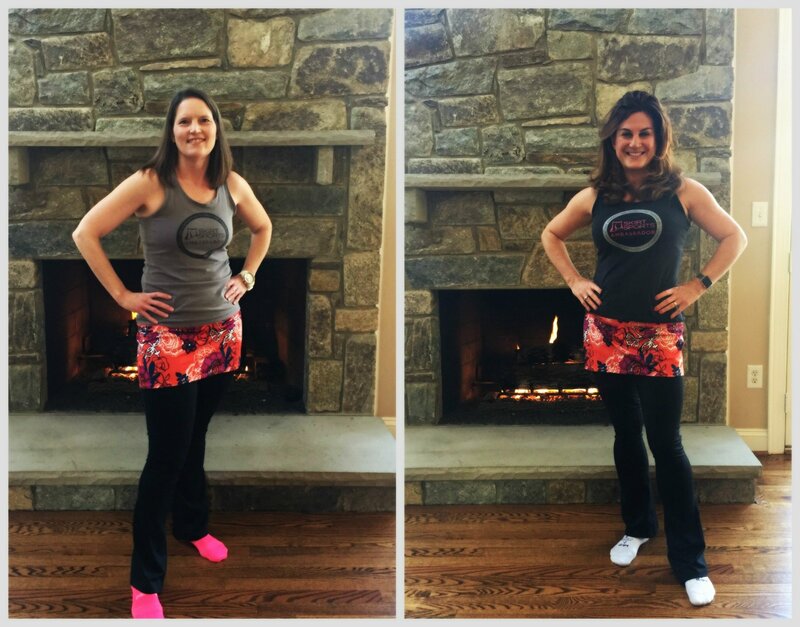 Deb and I both wear a size small, but our figures and personal style are quite different. As you can see from the photos, she’s an inch or so taller than I am (and has amazing hair), but I have long legs for my height. Meet the Skirt Box skirts! 1. Skirt Sports Lioness Skirt – this is one of Skirt Sports shorter skirts with 4″ shorties with grippers. Deb loves this skirt, but it’s a little short for my preference. 3. Skirt Sports Happy Girl – this is currently Skirt Sports’ longest skirt with 7″ shorties. I own a crazy number of these and wear them for running and casual wear. This was the first time Deborah had ever tried one on! 4. Skirt Sports Lotta Breeze Capri – I live in this capri for 6 months or more of the year. It’s my go to when the temps are between 35 and 65 (aka much of the fall, winter, and spring in Virginia.) 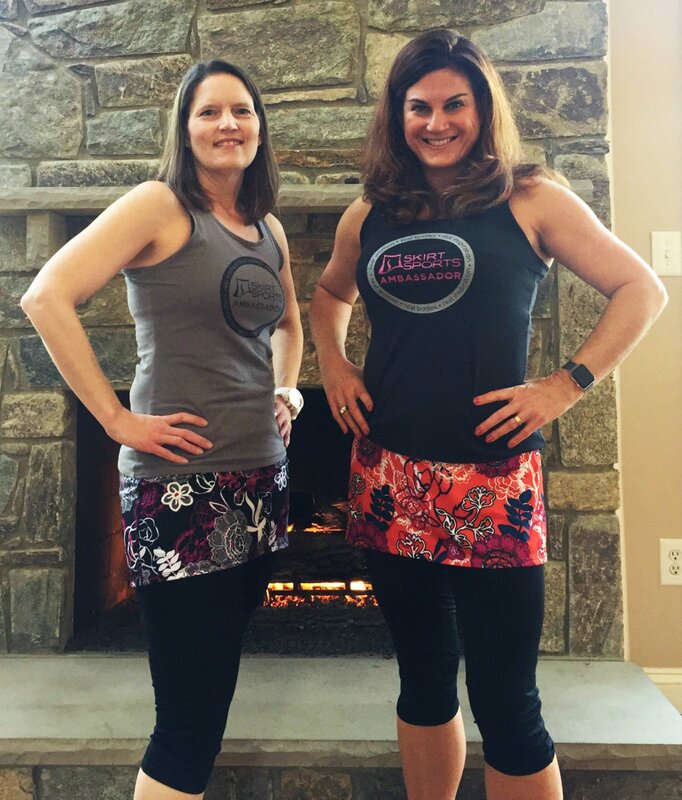 The skirt part is similar in length to the GGU, but it has lightweight capris attached. 5. Skirt Sports Tough Girl – this skirt plus tights is a combination of a skirt like the one attached to the Lotta Breeze Capri and a pair of boot cut tights. It’s a cute “around town” skirt, but I’ve never actually run in it. As you can see, Skirt Sports has options for everyone! 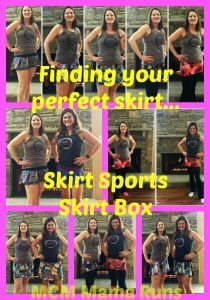 You should check out the new Skirt Box if you aren’t sure what style would work best for you. 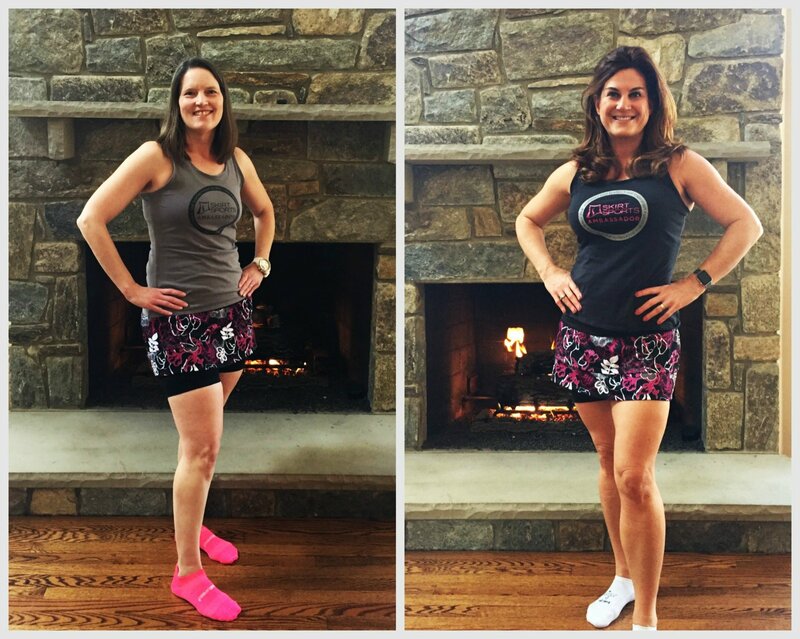 Check out Deb’s post on her thoughts about the skirts. 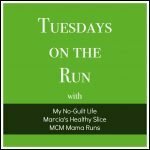 I’m linking up with Running on Happy and Fairytales and Fitness for Friday Five 2.0. 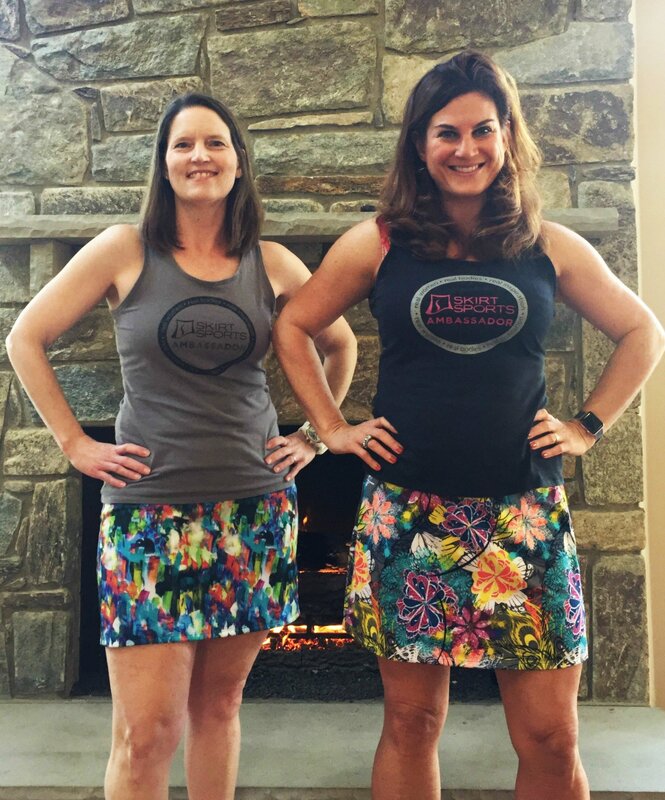 Skirt Sports Trunk Show: try on all the skirts! 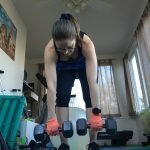 LOVED this post and the video. I have never worn a skirt but definitely going to check it out. You say you wear an S ? Is it tight around the waist ? I like a low sitting waist. For Athleta gym pants (and capris in general) I usually buy M.
I find that the waist sits below my belly button. I wear a small in Athleta capris, so a medium might work for you. Check their webpage for the size guide – I’ve heard that it’s really accurate. Awesome job ladies!! Cascade and Gym Girl are my faves, but for me is all about the pockets! Amy recently posted…Running for chocolate is always a good thing! I’m still on the fence about the Cascade, but my Gym Girl collection is starting to approach my Happy Girl collection LOL. I LOVE your video!!! This makes me want to try a skirt right now! I haven’t tried this brand yet. They look perfect. 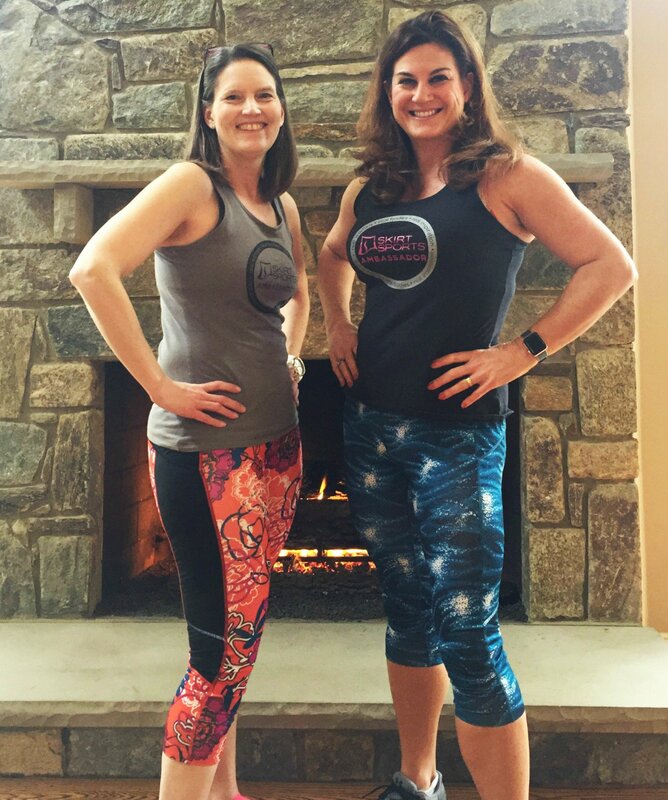 Michelle Rogers recently posted…Portable audio equipment for a group exercise class that rocks! I love that lioness skirt and the capris! So cute! 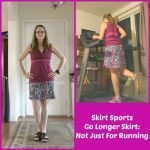 I don’t wear running skirts but I loved all the different patterns and colors that you got to try! I used to say I would never wear a running skirt, but once I converted, there was no going back LOL. This is such a great idea! Skirt Sports has come a long way since I bought my first SS skirt 10+ years ago. I know! Options for every body type now and gorgeous patterns. What a great idea!!! I really need to try skirt sports! You ladies have been raving about it forever. You should do it! At most it will cost you $10 (but I’d bet you end up with at least one skirt LOL). That’s nice that you can try on everything. I have long legs and a bit of a bootie, so I like things a little longer. There are definitely some options that seem reasonable for my shape. You should try the box. Their skirts are truly amazing. I like that the one skirt does have the elastic around the under shorts, I do find that sometimes the short tend to ride up for me so that is definitely a bonus. Yep, the two shorter skirts (Jette and Lioness) both have the grippers. Cute video! It is funny how the same size can look so different on each person 🙂 I think the box is a fun idea as long as it is easy to return the ones you did not want. 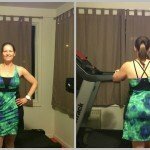 Great skirt review! Mary Beth Jackson recently posted…Hey baby, what’s your sign? Stitch Fix fashion! I know. The skirts always look shorter on me because my legs are long and I’ve got a booty LOL. And yes, returns are easy and free with the Skirt Box. Fun video! I’m definitely an UGG and Happy Girl fan! 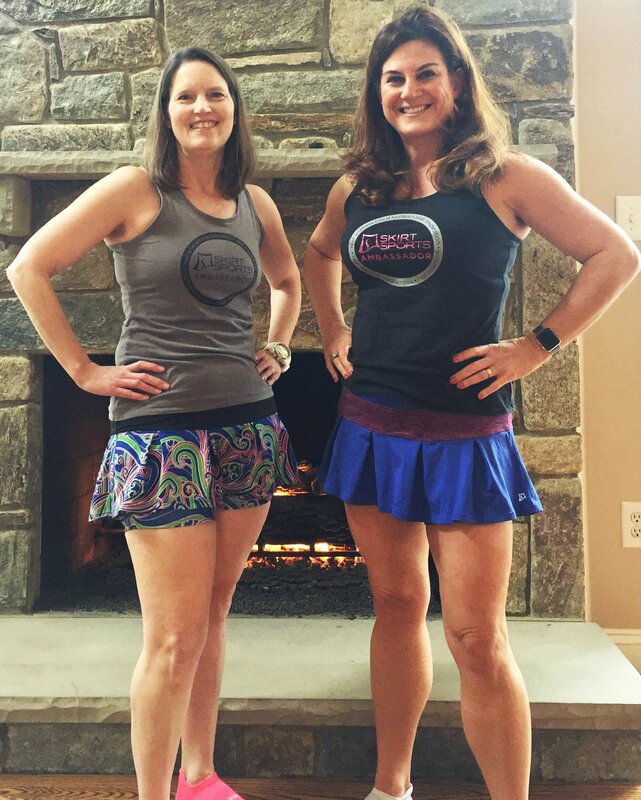 That Cascade Skirt is so cute, I may need to try that one! I wish I ran in skirts because you guys sell them so well! You should be skirt sports models!! You should try them. I used to say I’d never run in skirts and now I can’t imagine not running in skirts. 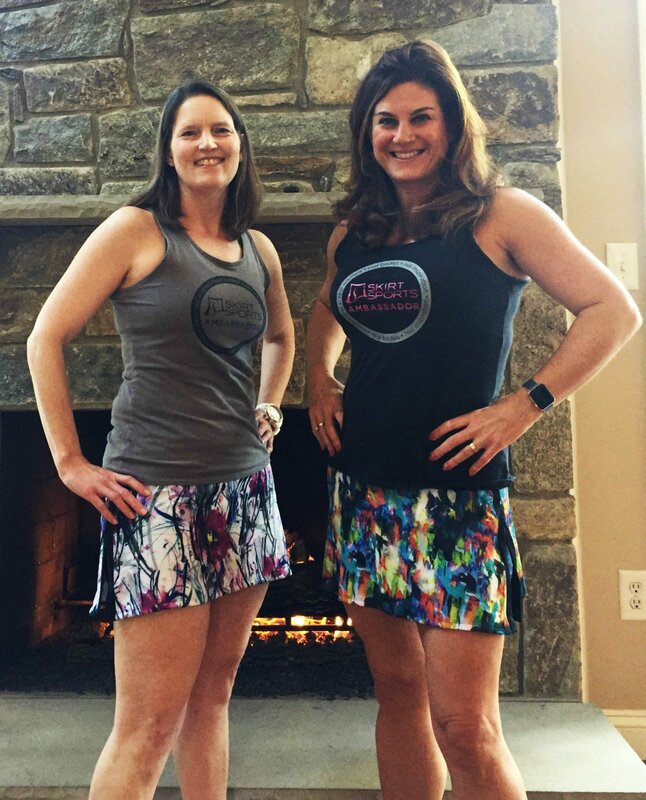 I haven’t been able to embrace the running skirt, but the patterns are cute! I tried some on at Kohl’s last month, and despite the amazing clearance prices, I just couldn’t pull the trigger. I do like the capris though! OMG you gals are so fun! Great to hear your voices and see all the options!!!! Kimberly Hatting recently posted…What’s there to rant about??? The skirt box looks great! There are so many fun options. Im not sure how but I still haven’t ever tried a running skirt! You should get the box! At most it will cost you $10 to see if you like them (and I’d be willing to bet you’d buy a skirt). How fun is this? I do love my SS gym skirts! Its nice to see all of the styles lined up one after another. And I’m sure you and Deb had a fun time trying them all on together. Yay for runner friends! It was a ton of fun. I hadn’t seen her in a while because life has been crazy. I need to be better about that. I know. My skirt collection is getting ridiculous now that I don’t just buy one style LOL. I like the lioness the best and def love the idea of a box so I can try them out and see which ones I like.